Our small companion birds do some things naturally that are quite entertaining. Anytime you spend with your bird, interacting together, is good socialization. Birds learn quickly and retain their mastery of “tricks.” There are many behaviors that a budgie will do naturally. With some practice, you can teach some new tricks and play budgie games with your parrot. Place your budgie at the end of a ladder, and say your cue word for this trick. Budgies naturally want to climb up, so you probably don’t have to even prompt your bird to go up the ladder, just work on giving him a hand signal or a verbal cue to do so. When your budgie seems to be getting the idea, start giving him the “up the ladder” cue from a few inches away from the ladder. 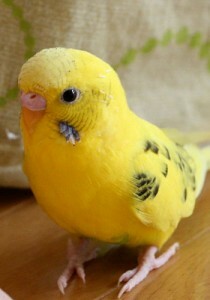 Your budgie should head toward the ladder and go up it. Try from even farther away. You’ve got it. Both you and your budgie will look really smart to your friends and family now! Prop a budgie-sized slide on the other side of a ladder, and you can entice your budgie, which probably has some inner daredevil in him, to slide down the other side and get a treat for that. At first praise your bird for touching the slide, and remember to use a verbal or hand signal each time he is at the top of the slide. Hold a treat at the end of the slide, and your parakeet will get the idea he should slide down. It is best to break tricks into steps. Start going down a small slide, then work up to a longer slide. There aren’t ready-made bird slides, you’ll need to design one from a length of plastic or find a toy that is parakeet-sized. You’ve seen dogs go through tunnels on agility courses — train your budgie to do the same. A good budgie-size tunnel is a toilet paper roll or toothpaste box. If you want something more durable, then find a length of PVC pipe at a hardware store. Train this trick in steps, so that you know your parakeet is comfortable going through things. The first step is going through a hoop. Start leading your parakeet through a sliver of a toilet paper tube cut into a ring. Or find a ring such as a bangle bracelet or plastic bird toy part. Assign a hand signal and or a verbal signal to this behavior, and be consistent in using it whenever your budgie is walking through the ring. Once your budgie is getting the idea and responding to your cue, cut longer and longer pieces of toilet paper tube, until it readily runs through a whole tube. If you want to make this trick even more interesting, create a bend in the tunnel. Maybe start using hamster tubing or create your own tubes with PVC pipes or some kind of hosing. Hold short training sessions and make them fun. If you or your bird becomes tired, find a way to end on a positive note and stop working. There are no rules on how often you train, just what’s comfortable for you and your bird! Be creative and check out the hardware store and used toys. Toys make especially good bird props, since they are safe for human babies. A piece of bangle bracelet (as a hoop) could be made of something toxic to a bird, so don’t let your budgie chew on it, or find an alternative. There are ready-made ladders for companion birds, but you’ll need to create many of your own props if you choose to use them. See? Budgie games are so easy to play with your parrot! This article was originally written by Lafeber. For parrot news and articles visit our Parrot News page. Next PostNext Post Can a Parrot Understand Probability?